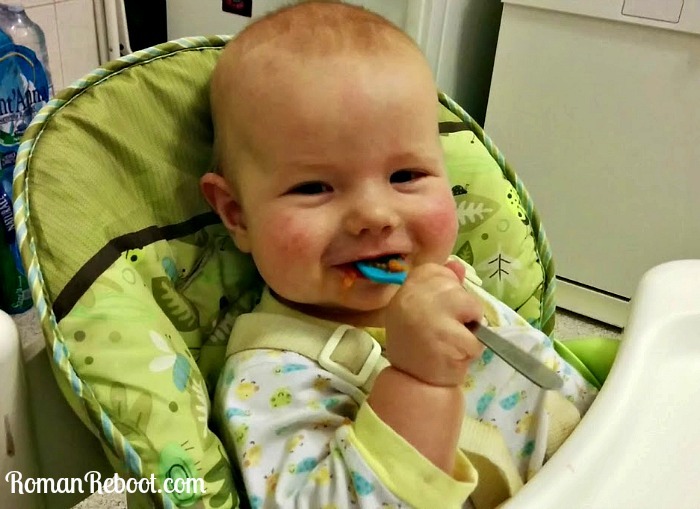 As I mentioned recently, we just started solid foods with Mac. I forgot how much of a pain solids are. Yeah, it is awesome seeing your kid doing a new thing. Yeah, they look really adorable. But, man, it is messy. Now I get spit up and random bits of food. Cleaning the giant high chair tray in the not-quite- big-enough sink is a pain. And then you have to remember to bring food for them when you go out. And spoons. And bibs. And even more wipes than usual. Luckily, we haven’t reached that point because we’re just dabbling with one meal (or so) a day, but it is coming. And soon. Making your own broth for cereal? Cool, sounds good to me. 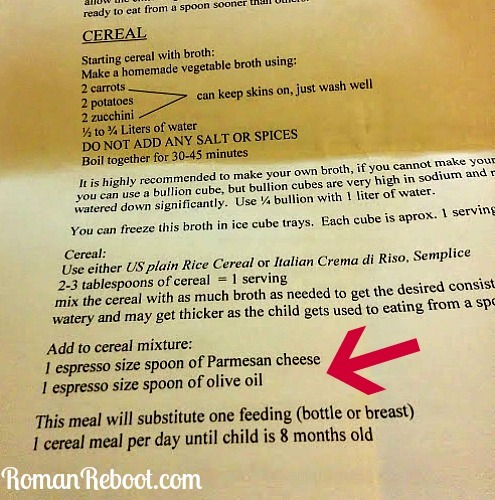 What cracks me up is that the Italian approach adds Parmesan cheese and olive oil right away. Priorities! What cracks me up even more is that an “espresso size spoon” is used for measurement. Because, of course it is. Yes, rabbit and veal. It is safe to say that baby food looks a little different here. No judgment. I just have to laugh that they put the most adorable magician’s- hat, want-to-be-your-pet, snowy rabbit on the packaging. So far Mac has done carrots, zucchini, sweet potato, banana, apple, and pears. He was tentative for anything non-sweet at first, but now is pretty enthusiastic about whatever we throw his way. We have plans to start with the white meats on Thanksgiving. Still working up to rabbit . . .
Want more differences? Differences around the house here. Differences on lifestyle here.